The first semi-final of the ICC World Cup 2015 is going to be held between New Zealand and South Africa today (Tuesday). 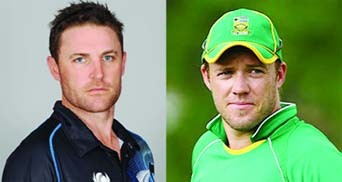 While New Zealand has appeared to be one of the clear favourites to lift the World Cup this year, this will be South Africa's chance to create history by going to a World Cup final for the first time.New Zealand and South Africa are no strangers to the knock-out stages of cricket's showpiece one-day event, but neither side has ever made the final. Indeed, the Proteas' quarter-final win over Sri Lanka was their first-ever win outside the group stage at a World Cup, but their tag as 'chokers' will return should they fail to beat their hosts at Eden Park.Such sentiment was spelled out for AB de Villiers' team by the country's Sports Minister Fikile Mbalula before the tournament. "We don't want you in the World Cup to add numbers and just become a bunch of losers," Mbalula said at the team's farewell function.By contrast, New Zealand will be playing their seventh semi-final having lost the previous six. They beat South Africa in an ill-tempered quarter-final four years ago and captain Brendon McCullum - who has scored 269 tournament runs at an astonishing strike rate of 185.5 - expects a memorable encounter. "Both teams are playing aggressively, playing an entertaining style of cricket and both teams are trying to win key moments rather than not lose them," he said. "Tomorrow will be a great spectacle and I expect the team that is able to handle the crunch situations the best will come out on top. "We'll have one team that's never made it to the final celebrating and the others will take it in their stride. "Taking a loss in stride would be difficult for South Africa given their history of bungled run-chases and inglorious World Cup defeats.De Villiers expects to have 15 fit players to choose from, with Vernon Philander back in full training and he admits selection will be a difficult task. "There are a few boys who have put up their hands in the World Cup," he said. "It's really difficult, especially after a win like that last one (against Sri Lanka). "New Zealand will make at least one change, with paceman Adam Milne ruled out with a heel injury. "Whoever gets the nod, we've got full confidence they will be able to go out there and perform their skills and fit into the game plan appropriately," he said.Whoever does perform, the opportunity for glory awaits with a date at the 100,000-set MCG against Australia or India in the final.